about the house & cut out some work. On the 1852 map of Bristol County, illustrated above, the town of Easton sits at the very top. 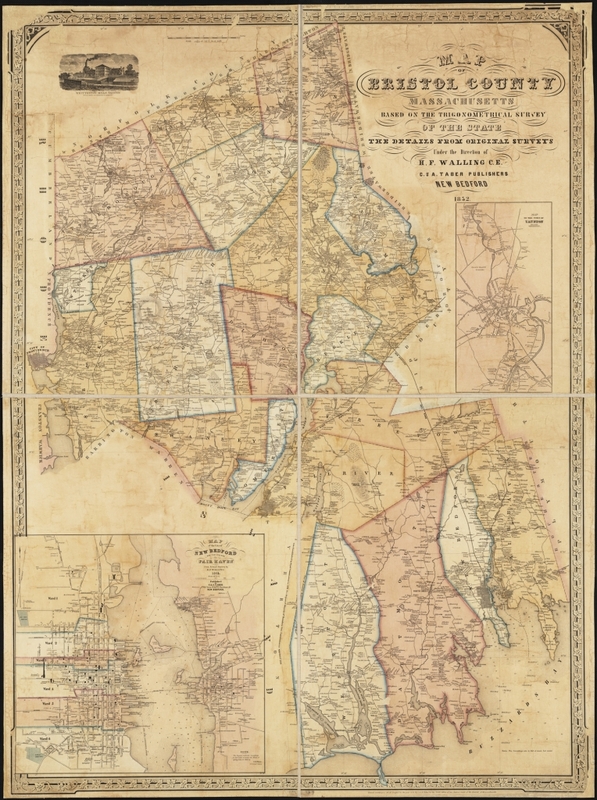 Its eastern border abuts Plymouth County, which was the home of Bridgewater (today’s Brockton), West Bridgewater, and more. On Easton’s northern line sits Stoughton in Norfolk County. To its immediate south lies Raynham, home of many Gilmore cousins. We often read of Evelina traveling to these three vicinities – Bridgewater, Stoughton and Raynham – to see family, friends, and vendors. To the west of Easton lies Mansfield – where Oakes and Oliver (3) caught the stagecoach for Providence – and Norton. Further south, on a NNW/SSE axis, is the somewhat bow-tie-shaped town of Taunton. Taunton in the 19th century was known locally as “Silver City,” for its silver manufacturing, being the home of Reed & Barton, F. B. Rogers and others. We seldom hear of Evelina heading there, but for some reason, she and her sisters-in-law were traveling there this afternoon. The ladies never got to Taunton, however, as an abrupt rain shower came down “poringly” while they were en route. “Good showers,”**too, according to Old Oliver, the kind of showers he’d been looking for most of the summer. When the rain commenced, the women drove their vehicle into Alson Gilmore’s barn and waited, then hurried into the house when “it slacked a little.” And there they sat, visiting with the Gilmores. With the notable exception of Boston, to which Evelina traveled several times a year, this map pretty well represents the geographic scope of Evelina’s life to date. The northern portion of Bristol County and its abutting towns constituted her largest neighborhood, her network of friends and family, her travel pattern, her home. That was her world. It would soon get larger. In any case, it is pleasant to think of Evelina heading to Taunton, (via Bay Road or the Turnpike?) and then having to take refuge in a close relative’s barn from a cloudburst. We, for better or for worse, don’t get to do things like that any more. And before the railroad came, it seems to me that Old Oliver did more importing and exporting via Taunton. I enjoy reading about all these pieces of the Ames story. Thanks!